Sometimes when people have difficult life issues, they forget (or perhaps never learned) how to advocate for themselves. Others have found that the ability to advocate for one’s self is necessary to wellness and recovery. You may feel as if you have lost control over your life, your rights, and your responsibilities, and that you have lost the ability and right to effectively advocate for yourself. You may have low self-esteem. 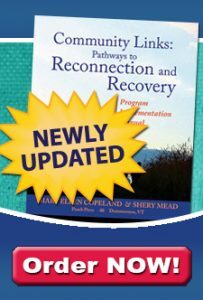 Regaining your sense of control by successfully advocating for yourself will give you back the hope and self-esteem you need to work toward recovery. Attending a WRAP group is a good way to learn self-advocacy skills. Speaking to someone in person is the most effective way to advocate for yourself. Make an appointment. Don’t just “show up.” Plan what you are going to say and the points you need to make. Practice with the help of friends, recorders, or mirrors if you feel unsure of yourself. Dress neatly for the appointments and be on time. Look the person in the eye and shake hands firmly in greeting, unless your culture has different courtesies. Call the person by name. Use positive body language. How you say something often makes a greater impression than what you say. State your message clearly and simply. Tell the person exactly what it is that you want. Explain why you need it. Tell them why it is in their best interest to respond to your request. Speak loudly enough to be heard without shouting. Expect a positive response. Listen to what the other person is saying and ask questions for anything you don’t understand. At the end of the meeting, restate any action that has been decided upon so you both understand each other clearly. For instance, you might say, “As a result of this meeting you are going to order a thyroid test for me.” Thank the person for their time and assistance. Send a follow-up note or e-mail thanking them for meeting with you and summarizing any agreed-upon action. It is a nice gesture. It also acts as a reminder and provides assurance that you both have the same understanding about the result of the meeting. People have found that some of the most powerful and effective Wellness Tools have to do with support. Often one of the best responses when you are having difficulty is reaching out to a supporter – either telling them how you are feeling or just spending time with them doing something you both enjoy. A team of supporters can protect you and keep you safe, even in the hardest times. For more information on self-advocacy and examples of Wellness Tools check out WRAP for Life and WRAP Plus. Everyone is different and you have the right to have these differences respected.